News from the winner’s circle. 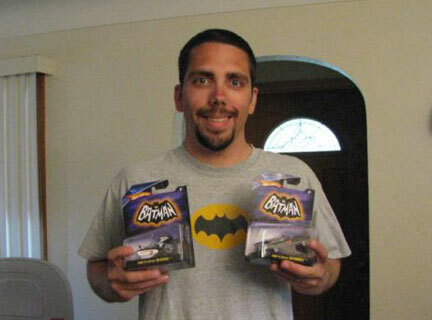 Just heard back from our first giveaway winner Mnbatman (also known as Kent Themmes) that he received the 1:50 Hot Wheels Batcycle and Batmobile set safe and sound. Thanks for the photo Kent. Nice shirt! Real Cool Shirt Dude, Where did you get that?